1867: Japan ends its history of isolationist politics, transitioning from a feudal shogunate to a more modern government. During the 1850s and 1860s, the country undergoes an industrial revolution and opens trade relations with Western nations like the United States. In January of 1867, Emperor Osahito (posthumously known as Emperor Kōmei) dies and is succeeded by his fourteen-year-old son, Crown Prince Mutsuhito. His reign will become associated with a rapid period of change and modernization in nineteenth-century Japan. 1869: Emperor Mutsuhito marries Masako Ichijō, the granddaughter of a minor Japanese prince. After their engagement and wedding, she takes on a new name, becoming known as Empress Haruko. She also becomes the first empress consort in Japan to have a major public role. Empress Haruko (pictured above) is unable to bear children; she later adopts Crown Prince Yoshihito, the emperor's eldest son with one of his concubines. 1880s: Empress Haruko institutes a new, Western-inspired form of court dress, arguing that Western clothing resembles traditional types of Japanese dress. 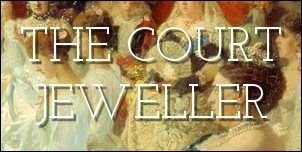 As a part of the new court attire, Haruko begins wearing Western-style jewelry, including a diamond scroll tiara made in Europe, possibly by Chaumet. The piece is topped by diamond star elements, which were popularized by the fashionable Empress Sisi of Austria. 1912: Emperor Mutsuhito (pictured above) dies at the age of 59 and is granted a posthumous name: Meiji. This posthumous name becomes synonymous with the period of change during his reign; it's also generally how his wife's diamond tiara is identified. His son, Crown Prince Yoshihito, succeeds him as emperor. Emperor Yoshihito's wife, Sadako, becomes the new Japanese empress. The new emperor grants his adopted mother, Haruko, the title of Empress Dowager. 1914: Empress Haruko dies at the imperial villa in Numazu. Like her husband, she is granted a new posthumous name, Shōken. 1920s: Empress Sadako poses for an official portrait wearing the Western-style imperial court dress, including the Meiji Tiara. She wears the piece without the diamond star toppers, which have been switched out for a series of large round diamonds. 1926: The emperor dies and is given his posthumous name, Taishō. He is succeeded by Crown Prince Hirohito, the oldest of his four sons with Empress Sadako. Hirohito has been married for two years to Princess Nagako, who becomes the new empress. She now has the exclusive right to wear the Meiji Tiara. 1933: Empress Nagako wears the tiara in an official portrait. She is the last empress to be depicted wearing the tiara with its original diamond stars. 1951: Empress Dowager Sadako (pictured above with her grandson Akihito) dies in Tokyo at the age of 66. She is granted the posthumous name of Teimei. 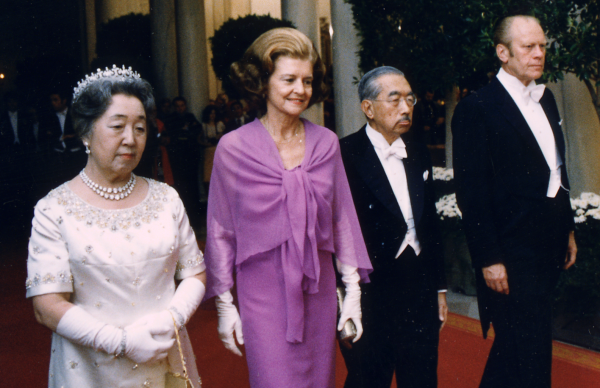 1975: Empress Nagako wears the tiara at the White House during a state visit to the United States. On this occasion, she wears the tiara without either diamond stars or its large round diamond topper stones. 1989: Emperor Hirohito dies; he is given the posthumous name of Shōwa. Hirohito and Nagako's son, Akihito, becomes the new Japanese emperor. 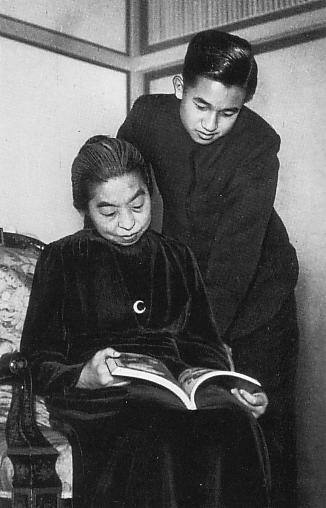 Akihito has been married to a commoner, Michiko Shōda since 1959. Although his parents, especially Empress Nagako, strongly opposed the marriage, Akihito and Michiko (pictured above) have been wed for thirty years with three children by the time of their enthronement in 1990. 1990: A century after the piece was made, Empress Michiko wears the tiara in an official portrait. 1993: Empress Michiko wears the tiara during the wedding celebrations for her son and daughter-in-law, Crown Prince Naruhito and Crown Princess Masako, who wears the traditional wedding tiara and necklace for Japanese crown princesses. 2000: Empress Nagako dies at the age of 97; she was the longest-serving empress consort in Japanese history. Her posthumous name is Kōjun. ca. 2012: After years of suffering from pain in her head and neck, Empress Michiko stops wearing tiaras altogether. The Meiji Tiara will likely not be seen again in public until it is worn by the next Japanese empress: Masako, Michiko's daughter-in-law.